The Moran College in a reputed college in the region. It provides quality education. 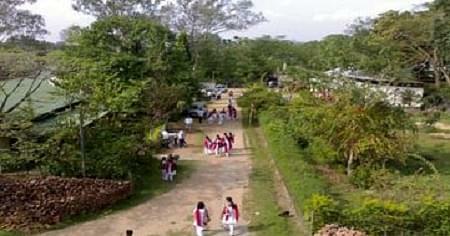 It is situated in a sprawling campus surrounded by greenery. The college campus has the perfect learning and teaching ambience. The faculty is also involved in providing the students with better learning. The college also tends to inculcate intellectual, ethical and moral values in the students. The college infrastructure is also decent. The college has state of the art facilities as well. Airport: The college is at a distance of 53.1 km from the Dibrugarh airport and thus reachable by hired taxi or cab. Railway Station: The college is 40 km from the Dibrugarh Railway station and accessible by cab or auto. Bus stand: The college is at a distance of 28.6 km from the Rajgarh Bus stand. Hence reachable by hired taxi or cab. Accreditation: The College has been accredited with a Grade B by the NAAC team. Library: The College has a well developed library. It has an awesome collection of books, reference books and reading materials. It also has the subscription of journals. It provides the students with knowledge and educational needs. The library is always the heart of a college and the most important asset too. It aids in shaping the students. It is a three level establishment. Research: The College encourages the students to pursue research. Scholarships: The institute provides scholarships to the deserving students. The financial assistance is very helpful to the students. Faculty: The College has a well experienced and diligent staff. The college fraternity encourages the students to maintain discipline and inculcate knowledge. Dibrugarh University offers MA, M.Com, M.Sc, M.Ed, M.L.I.Sc, LL.M, MCA, MSW, M.Pharm, M.Tech and MBA courses at PG level along with M.Phil, Ph.D. and D.Sc./D.Litt programs at Research level.